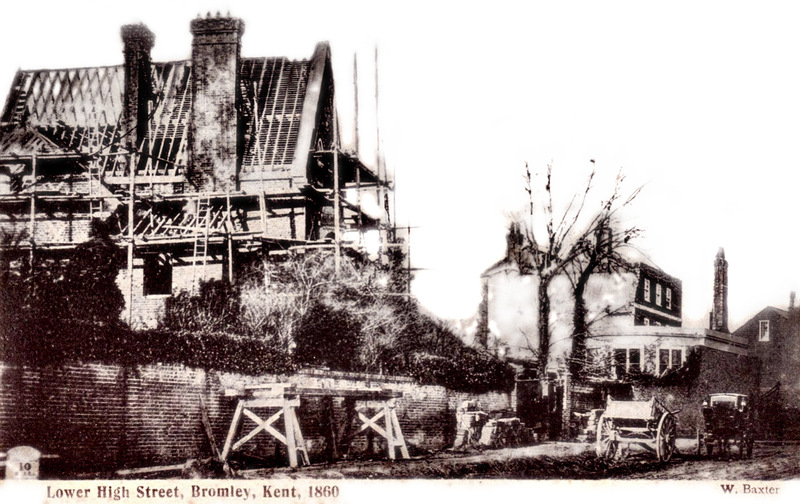 Bromley Civic Society | Promoting awareness and protection for the built and green heritage of Bromley Town centre. 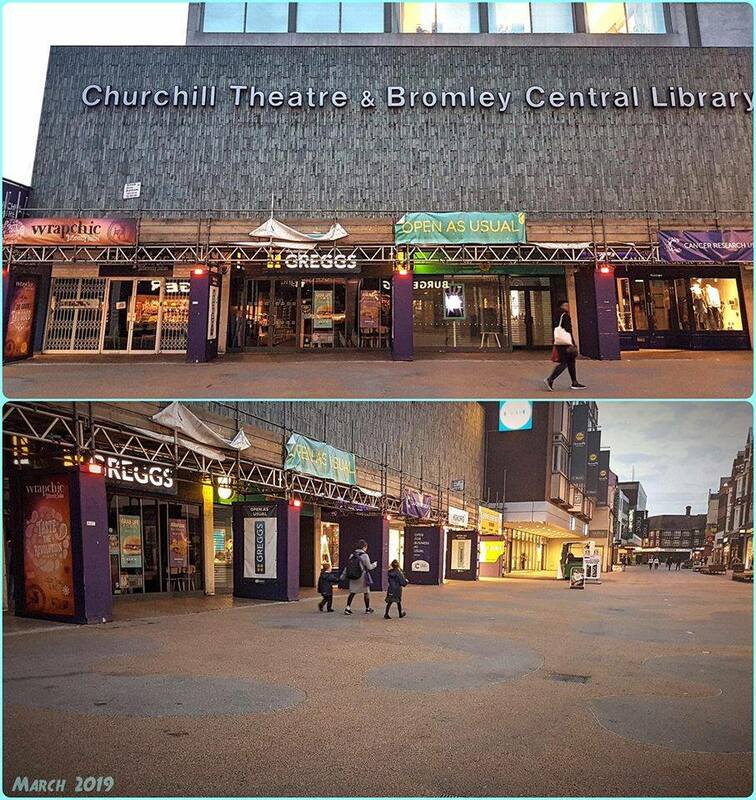 Thanks to Bromley Gloss at :https://www.facebook.com/BromleyGloss/photos/a.1400163736933691/2338726886410700/?type=3&theater — at High Street, Bromley. 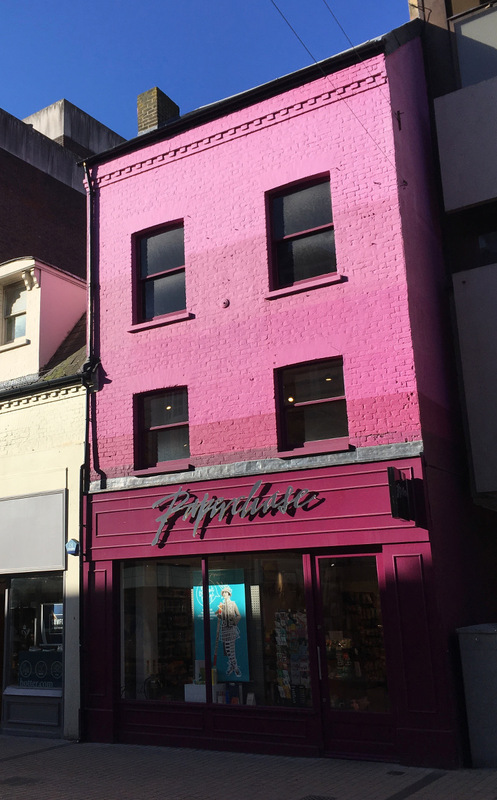 “A planning application has now been lodged by the Council for removal of the tiles on the Churchill Theatre/ Library building to survey the underlying concrete and paint over with grey paint. 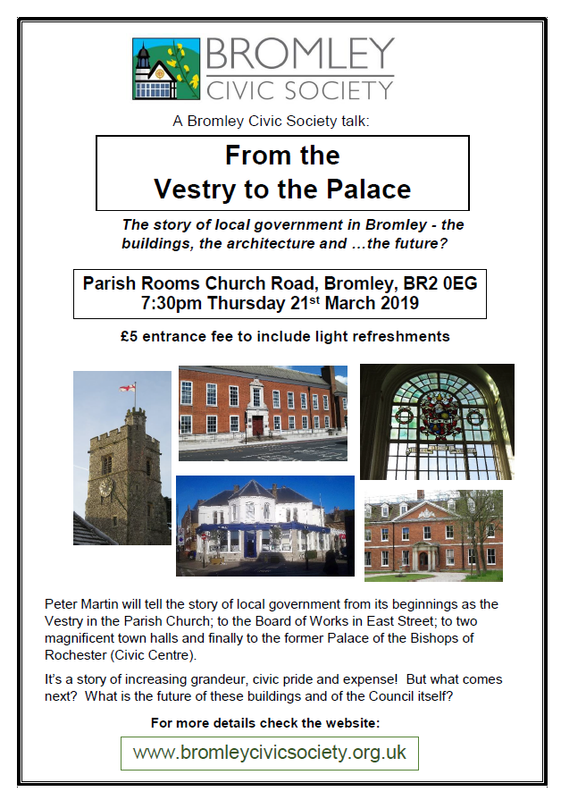 This talk will cover the story of local government in Bromley; the buildings, the architecture and what the future might hold. For more information, please see our flyer. Have the most amazing time this half term! 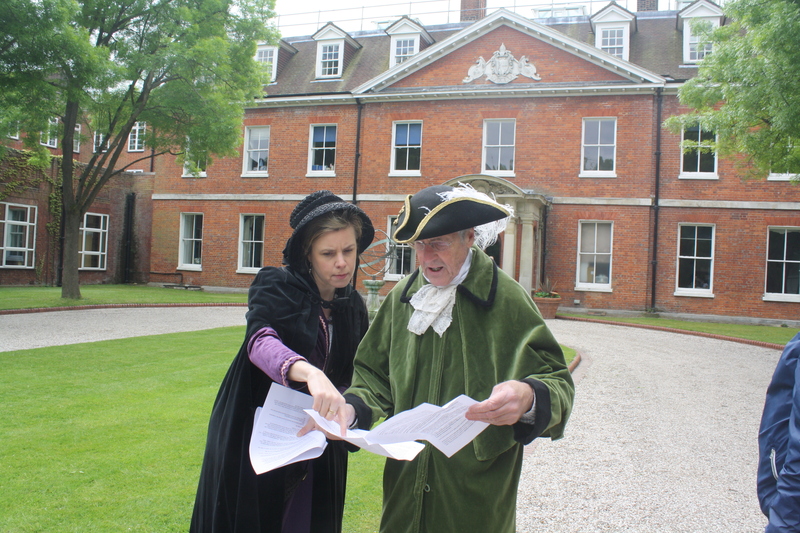 Do our new family Heritage Treasure Trail around our historic buildings in central Bromley. 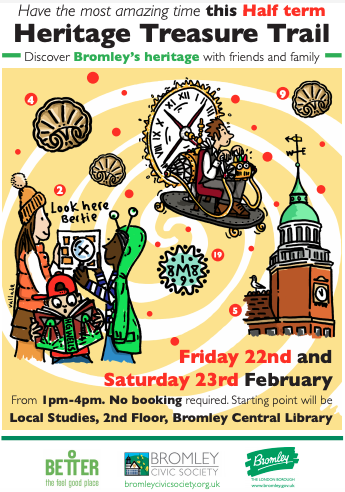 No booking required, find us in the Local Studies Centre on the 2nd floor of Bromley Central Library (on the High Street) from 1-4pm. Half Term fun! Our new family heritage trail! 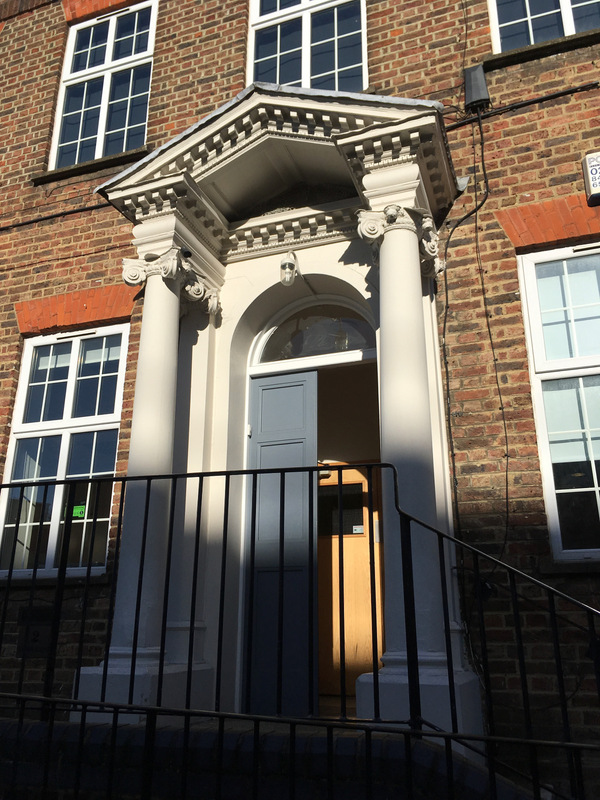 Please note that the venue for Benedict O’Looney’s talk on historic architecture in south London has been changed to the Small Hall, Bromley Central Library (see below). Benedict will also speak about progress with the current plan to restore the Royal Bell hotel. The latest BCS newsletter was published before Christmas containing all the latest information about town centre planning and other important issues. One important story concerns the approval given for the revised planning application for the Royal Bell hotel on 13 December. Benedict O’Looney, one of the architects, will be giving an update on progress with the Royal Bell at a talk in February (see below). 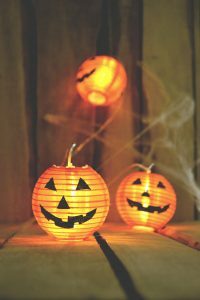 Bromley Civic Society will be leading a ghost walk this Halloween, Wednesday 31 October. Find out about Bromley’s murky past with tales of ghosts, murder, political intrigue and execution !!!!! Meet at Belgo in Queen’s Garden beside the north entrance to the Glades from 6:15pm for a 6:30pm start. Tour 1 hour 30mins, ending in the spooky Victorian labyrinth of the Bromley Little Theatre (in Compass Lane off North Street) where we will hear the strange story of the white lady of the theatre! See our flyer for further details. The 17th century Grade 1 listed, Wren inspired buildings form a quiet oasis in Bromley North. 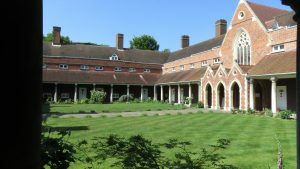 The walk will take us through the two quadrangles of the main College, into the Chapel (1862), around the grounds to see Sheppard’s College (1840) and some 200 year old graffiti. The 18th century Georgian home of the Bishops of Rochester was transformed in 1845 by Victorian entrepreneur Coles-Child. We will see the grand staircase, wood carved panels, an Adams fireplace and more; also historic landscape features in the adjoining park. A walk around the old town of Bromley to get a flavour of its Victorian heyday, when many buildings in the Arts and Crafts style were built and the young Herbert George Wells was experiencing life that would later shape his novels. 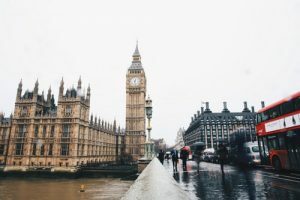 Bromley Civic Society is a member of The London Forum which works to protect and improve the quality of life in London. It is a most influential body with input into Government and London Plan policy. 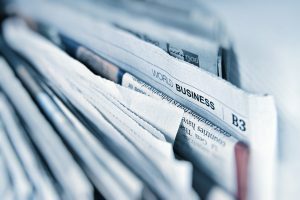 Take a look at their regular NewsForum bulletins and see what is going on elsewhere and what other Societies like ours are dealing with. The 2018 summer edition is now available here for viewing and downloading. Do please pass this on to others who may find it of interest. You can find all previous editions of newsforum on the London Forum website. 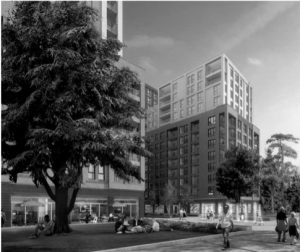 The planning application for the “Churchill Quarter” development in Bromley town centre has now been submitted (planning reference: 18/02181). The development, adjacent to library gardens, is a co-development with the Council providing the land and Countryside Properties responsible for building and operations. Before and after images showing the effect of the development can be seen on the right. Objections to this development should be submitted as soon as possible. Civic Day, with the slogan “I care about where I live”, is a nationwide event organised by Civic Voice (formerly the Civic Trust). 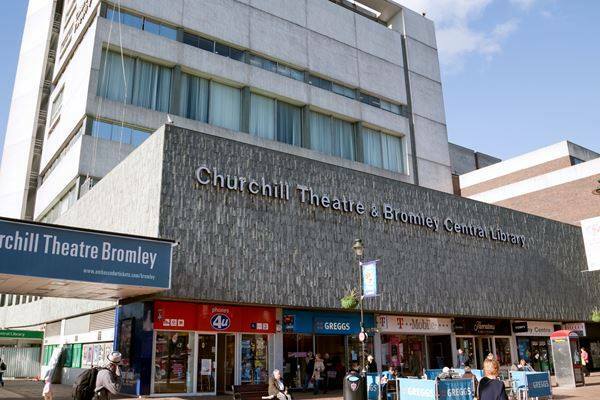 Bromley Civic Society is contributing to Civic Day by staging four heritage walks around Bromley Town Centre on Saturday 16th June. All four walks are free and each will take about 90 mins. They will start and finish in The Glades at the north end upper level near Boots. 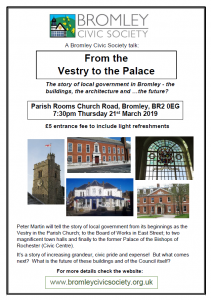 We will have a display there about the heritage of Bromley and more details about the work of the Bromley Civic Society. The idea is to engage and inform visitors about the town’s rich heritage of architecture and green spaces and the stories that can be told about the characters that lived there in the past. 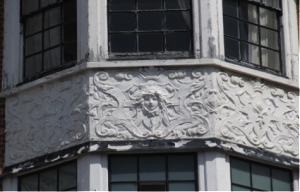 People coming on the walks will be encouraged to look up and see details of buildings they may not have noticed before although they may have walked past them many times. If residents and visitors know more about their local environment and the history that shaped it, they are more likely to end the day by saying “I care about where I live”! For more details about the walks, please see our flyer for the day. Bromley Civic Society has been fortunate enough to secure a meeting with the new owners of the Royal Bell Hotel, High Street, Bromley. They will be hosting a special members only meeting at the Bell on Saturday 28th April at 10.30am where there will be a chance to see proposed plans for the development of the hotel. Peter Martin, Vice Chair Bromley Civic Society, writes about the Royal Bell Hotel. This story appeared in our September newsletter. With thanks to Jo Hone for the photographs. The Royal Bell has stood empty and forlorn now for some 5 years. Once the grandest hotel in Bromley, its most recent history has been somewhat chequered – as a troublesome nightclub (the horrible red plastic ‘Bromleys’ sign is still over the door), before that the ‘Sky Bar’ and before that a rather down at heel pub. Many will remember it as a Bernie Inn where you could get an excellent roast dinner in the large hall on the first floor at the back. A group of people came together in 2012 to see if anything could be done about the state of the building. We discovered a stalemate between British Land (owners) and Spirit Group (leaseholders) that seemed destined to keep the building empty for the next 20yrs. 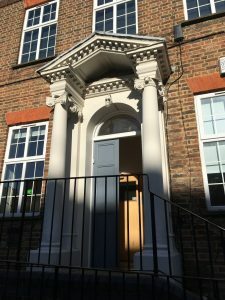 The Bromley Arts and Community Initiative (BACI) was formed to look at ways of re-opening the building as a venue for theatre and music along with arts workshops and community rooms supported by a commercially run café/pub on the ground floor. The Heritage Lottery Fund’s Heritage Enterprise scheme, it was hoped, could provide significant funding. Bromley Council and the Social Investment Business helped towards feasibility studies. The Royal Bell dates from 1898 and is Grade II listed and was designed by Ernest Newton, an important Arts and Crafts architect and Bickley resident. 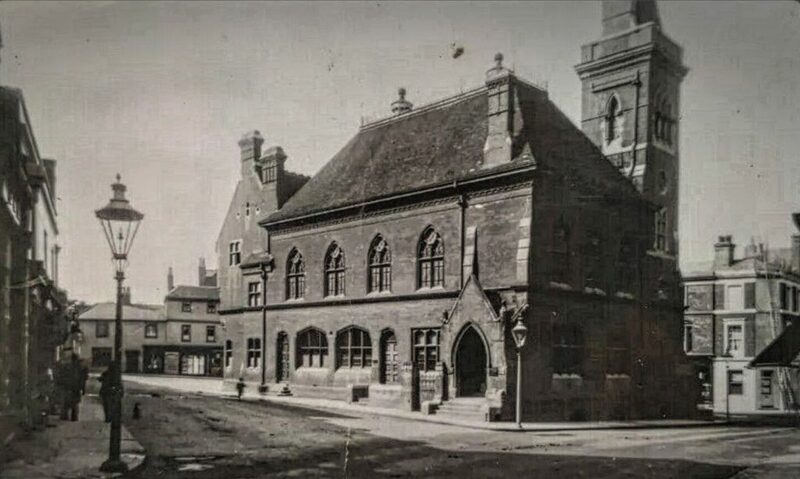 It replaced an earlier hotel on the site that was one of three important coaching inns that were the mainstay of the local economy throughout the Victorian era. Bromley was a convenient stop on the road to the coast where travellers rested or changed horses for the onward journey. Jane Austen may have stayed in the Bell as she famously refers to it in ‘Pride and Prejudice’. It was granted the prefix ‘Royal’ when it was appointed as a posting house to Queen Victoria, after which royal coaches would change horses there. On these occasions stablehands were required to put on scarlet uniforms. When seen from the High Street it is obvious that the Royal Bell was designed as a group, including No 175 near the Market Square and the former Martins Bank, now William Hill (spot the ‘M’ in the roundels on the black lead-covered bows). A distinctive feature is the white painted pargetted strapwork under the bow windows, with its Arts and Crafts lettering and depictions of bells, gremlins and nymphs. The white paint has probably preserved the pargetting in good condition – originally it would have been bare plaster, dark brown in colour (see photo). Newton clearly hoped that this would be the beginning of a grander High Street but it was not to be; to the north past no.181, the older Kentish cottages still remain. The 1920s photo shows a glass covered canopy over the front door adorned with signs. It is no longer there of course but during the condition survey, a piece of stained glass with the letters RB was discovered on the floor of the stables at the rear. Could this be the remains of the canopy? The 1920s photo also shows shopfronts inserted in the frontage. This is something that could be considered again as a means of improving the viability of the building as a whole. Inside, Newton provided a grand ballroom on the first floor with a gallery and characteristic chimneypiece. These are still there but a large hole has been carved in the floor of the ballroom (in the 1980’s?) 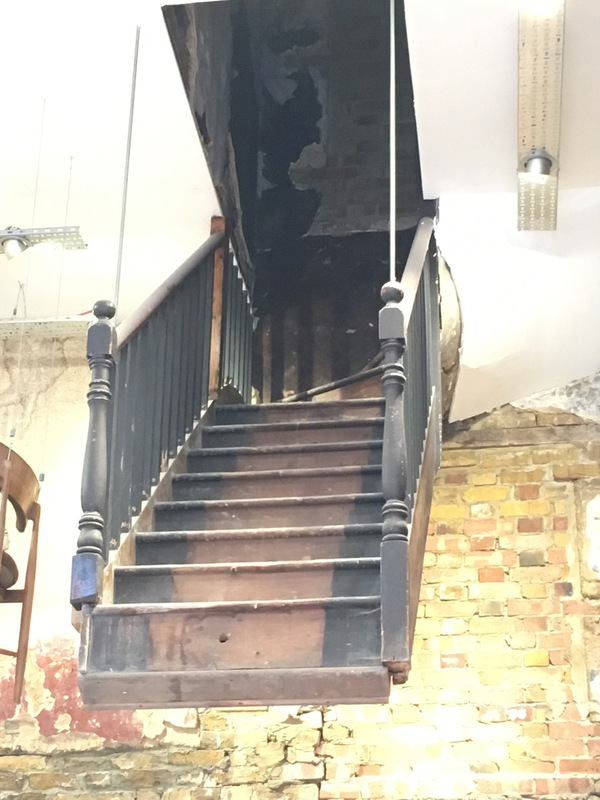 to allow for a curved staircase to be inserted (since removed). The first floor rooms in the front overlooking the High Street have original chimneypieces and decorative ceiling still intact. During the condition survey commissioned by BACI some asbestos, dry rot and water ingress in two places were found (the leaseholders have since dealt with these problems). 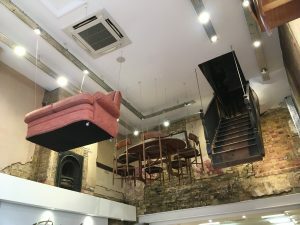 A large range of further repairs and adaptations were costed – including installation of disabled lifts and bridging over the floor of the ballroom to enable its use as a venue for music and theatre. The complexity and total cost proved too much for a voluntary organisation to handle without a commercial partner. In 2014 we heard that Antic Ltd had taken a lease on the Royal Bell. 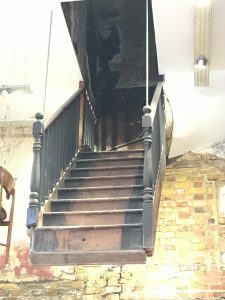 Antic are a pub company that have rescued several historic buildings in south London and they seem an ideal company to tackle the Royal Bell, albeit not as we originally envisaged. Antic have carried out a sympathetic refurbishment of the Railway Tavern opposite Bromley North Station and the pub now seems to be operating successfully. Anthony Thomas, the Chief Executive of Antic has said his approach to refurbishment is ‘slowly, slowly’ and it may be years before the building is fully operational. He is open to suggestions about arts activities in the Royal Bell and has included the showing of films in a mini arts cinema in the stables building at the rear. In August, he said that they were still awaiting the completion of the lease, they hope to conclude next month… and soon thereafter make a start on works. Tunnel Shoes occupy the original 1902 premises of Boots the Chemists. The Art Nouveau wrought iron work in front of the first floor windows is typical of boots in this period and similar work can also be seen in Boots old shop in the Pantiles in Tunbridge Wells. 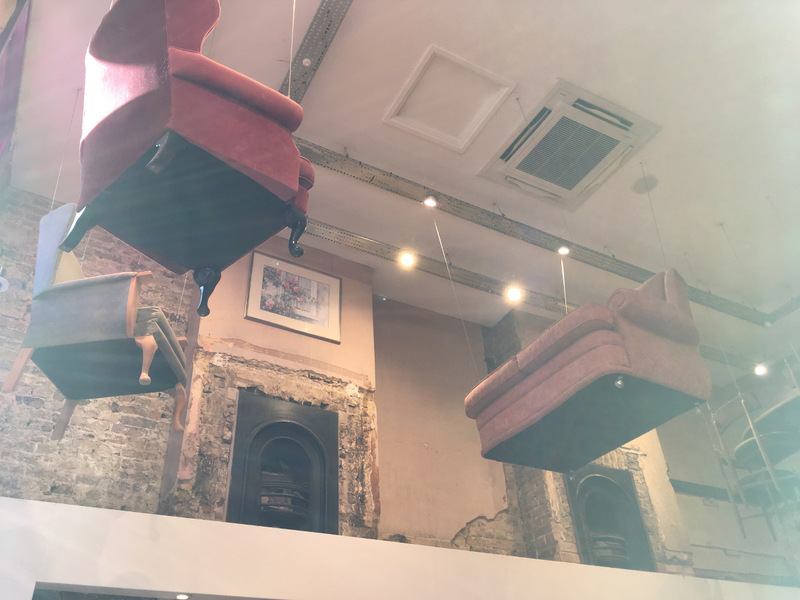 Behind the modern false ceiling the gallery of Boots famous ‘Penny Library’ still survives. 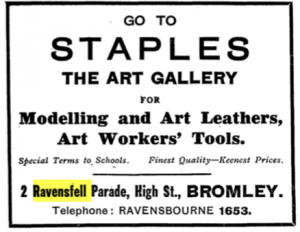 The building replaced that of Rawes School, one of Bromley’s most important educational establishments in the 19th century. Bromley Mystery 🛑 Have you got a theory, or are you in the know about the Tunnel Shop on Bromley High Street North. Remember Tunnel Discount Shoe Shop… A decade ago or there abouts it shut down, and has continued to stand empty to this day. Jason : I looked into leasing this property, however was told it was already sold to developers to build a block of flats. That was however 3 years ago so not sure if that has changed. The problem is the rent for the shop is so high nobody would ever be able to cope with it, so it’s been dead. 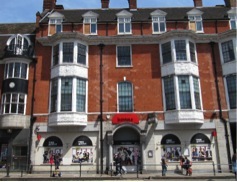 The property occupies a prominent position close to the junction with Market Square. 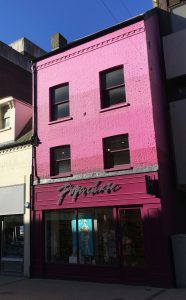 Nearby multiple retailers include Primark, McDonald’s, and William Hill together with many banks, restaurants and bars. (See attached Street Traders Plan extract). 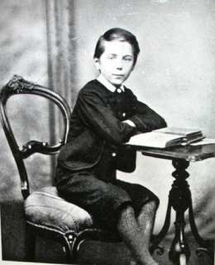 Built, at his own cost, by the new Lord of the Manor, Coles-Child. The bricks were from his own brickpit, from where Havelock Rec is now: http://friendsofhavelockrec.org/about-the-brick-pit-of…/. It seems that it was at least 3 different buildings kludged together… most of its life rented by an estate agents, included the police station with a cell, and housed the fire engine for a while. But the large upper room was never used for council meetings (making the ‘town hall’ name a misnomer). “This was demolished in 1933 and replaced with the current neo-tudor buildings.” from london-footsteps. It replaced a much smaller, more traditional market building in the centre of the square. 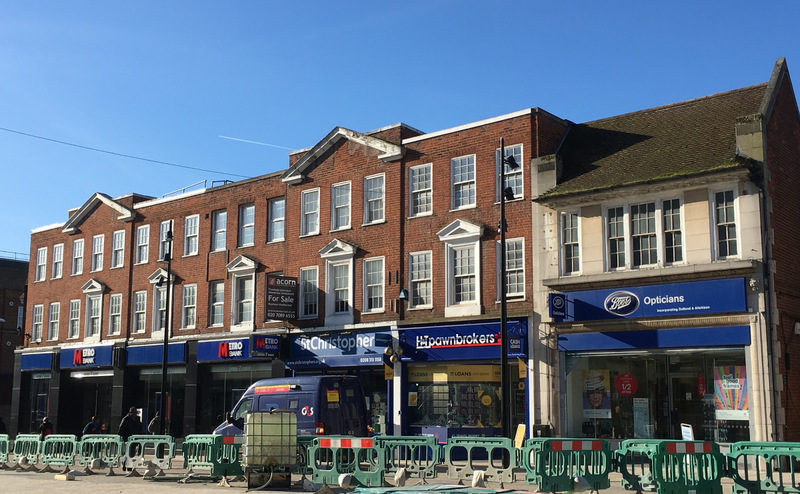 Bromley Town Area Action Plan – update as at March 2019. The AAP was drawn up and adopted by Bromley Council in 2010. The plan identifies the following sites in the Town Centre for development. It has been somewhat modified by the Local Plan adopted in 2018. Site A (Site 2 in the Local Plan): Bromley North station. The site is in several ownerships but mainly Network Rail. The AAP plan is to redevelop the Station and area behind for a mixed use development comprising 525 housing units, 2000sqm offices, 230sqm cafe/retail and unspecified community space. Part of the site is identified as possibly suitable for a tall or taller building. An application for a 23 storey block on one small site was opposed by BCS and refused by Council in 2018. The Council are considering drawing up a Masterplan for the whole area to prevent piecemeal development. The Station building is Grade II listed and would be retained. Site B: Tweedy Road adjacent to Bromley & Sheppard’s College. A scheme for 72 housing units which complied with the (then emerging AAP) was opposed by BCS and refused by Council on grounds of harm to the setting of the conservation area and listed buildings. The developers of this Council owned land went to appeal and lost. A new scheme, also opposed by BCS because of harm to heritage assets was nevertheless approved by Council and is expected to be built in 2019. Site C: Old Town Hall, Tweedy Road & Widmore Road and adjacent Car Park – Council owned Proposals for hotel conversion of both Town Hall buildings and flats on the car park was approved by Council but not implemented. Currently the Council are negotiating a sale with a developer for office use. Site E: The Pavilion. AAP proposals to move these leisure facilities onto the Civic Centre site and extend the Glades shopping centre have been abandoned. Bromley Mytime, a charitable trust, has completed a £5M refurbishment of this leisure centre in March 2012. Site F: Civic Centre (Local Plan Site 1). AAP proposals were relocation of the Pavilion Leisure facilities, housing and retained Council use. 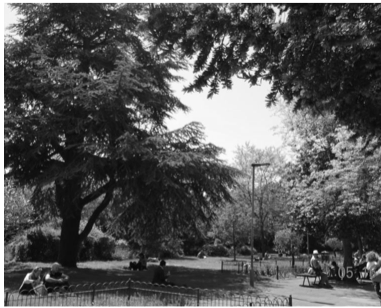 Current Local Plan proposals are retained offices, retained car park , 70 housing units including conversion of the Palace building, retention of south east open space as a public park as now. 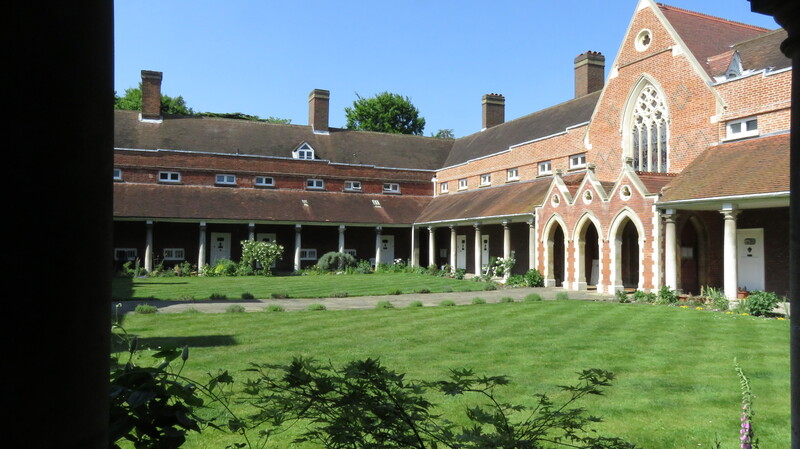 BCS sought restoration of the Palace grounds in consideration of what has been lost to build Kentish Way, the multi-storey car park & the newer Council offices and continued public use of the Grade II listed Palace. This has been rejected by the Council. Site G: Lower High Street (Local Plan Site 10 now extends to include BS Station and platforms). AAP proposals for a shopping Mall now scrapped in favour of the Local Plan modification for 1230 residential units plus offices. Vicinity of TK Maxx site is identified in the AAP as possibly suitable for a tall/taller building. This gave rise to a 2018 consultation by the owner for a 20 storey block of flats opposed by BCS. No planning application as yet. This is the most controversial of all the development sites. The Council intend acquiring by CPO the 40 homes in Ethelbert Close for what is called Phase One – Churchill Quarter. This is a co-development with the Council of 410 flats still awaiting a decision. 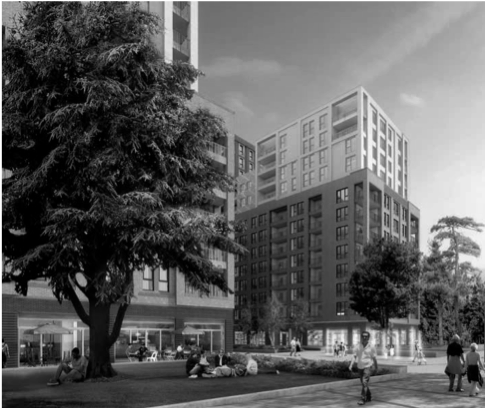 The AAP Inspector required the Council to produce a Masterplan for the whole site but this was only produced in 2018 well after the Churchill Quarter application was made and proposes a mass of tower blocks. The upper part is in the town centre conservation area and environmental groups including Historic England have objected both to Churchill Quarter and the Masterplan. A decision on both from the Council is still awaited. In 2014 Crest Homes implemented a large flatted development in Ringers Road on part of the site which had already gained permission from the Council before the AAP have been drafted. existing multi-storey car park with a nine-screen multiplex cinema, hotel and 200 homes in a very high tower. (Planning ref: 11/03865/FULL1). The outline plans predate the drafting of the AAP and the development is now complete nicknamed variously as the ‘ski slope’ or ‘titanic’ because of its shape by locals. “Wright Brothers’ attractive bow-windowed shop was taken over by a High Street chain store, who a few years ago took great trouble to reproduce in every detail this lovely frontage, when they needed twice the space. Few shoppers can tell where the original part and the new section join.” Murial Mundie nee Searle, 1988. Period furniture and decor of the first floor, suspended. 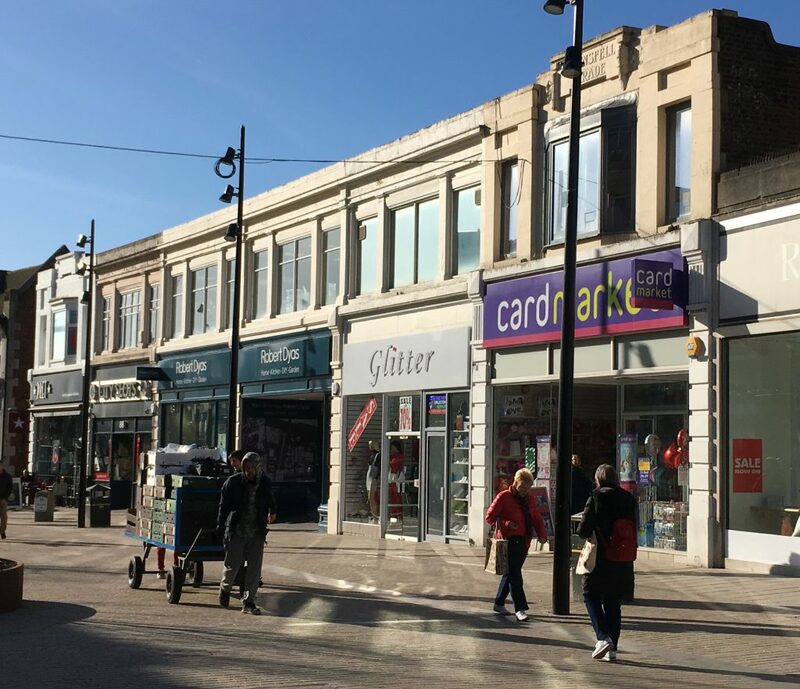 This parade of shops was built about 1930 when this part of the High Street was developed, replacing a line of fine villas that overlooked the Ravensbourne valley. The parade is fronted in brick with stone ornamentation, the broken pediments and sash windows of Neo-Gothic style. Bromley Manor Parade, in brick Neo-Gothic style. The first mentions in the business listing of Kelly’s Directory is the 1932 edition. A modest 1923 parade of shops, with nicely proportioned windows above, in Art Deco style. They occupy the whole front of what used to be the large garden of Ravensfell House. Ravensfell House was built for an Australian merchant* ,John Richardson, and was the first, of a number, of fine villas overlooking the Ravensbourne Valley built in 1858 at the coming of the railway. There is a note that John Richardson corresponded with George Sparkes (who retired from being a judge for the East India Company) next door at Neelgherries, about ancient lights and greenhouses. Prior to the arrival of the railway in 1858, Bromley High Street stretched only a short distance south from the Market Square. Redwood House on the east side (now the site of Marks & Spencer and Neelgherries on the west side (where the library is now) were the limit of continuous development. Bromley House and Bromley Lodge further down the hill had fields between them and the High Street itself. After 1858, the area between here and the station began to be filled, mainly with detached Victorian houses. 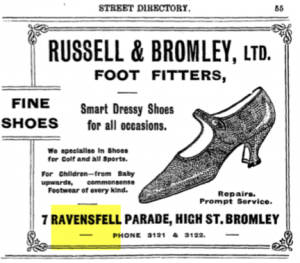 When Ravensfell House was built, and for a while afterwards, it was the most westerly building on the high street. It is recorded that the road next to it, Ravensbourne and Ethelbert Roads, were laid out in 1870-1872. This (now demolished) mansion had been built in the late 1850s and only survived for just over half a century. When the property was demolished there are deeds for it, describing the property of the Richardson Family to include Ravensfell House, Mill Pond Meadow, and Kingswood Avenue and ‘Lascelles’, in 1922. “In summers around 1920, public entertainments were given in a garden marquee” (Murial Mundie nee Searle). The first record, in the local business listings for Ravensfell Parade, is in the 1924 Kellys Directory, where it informs us that Number 6 Ravensfell Parade was the establishment of Rae Bertina, who was a ‘Costumier’. No. 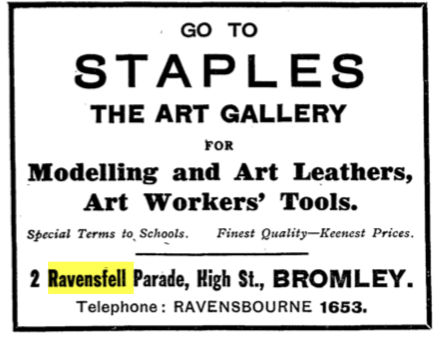 2: Staples, makers of picture frames, gilders, pictures cleaned & restored artists’ & crafts materials, with an advert and listed in 3 places. *thanks to BBLHS, Bromleag, June 2009.